I'm ferrying over the last of my Amazon posts here like Robinson Crusoe, because I'd wanted to include the description of my butsudan now that I'm in the midst of watching Musashi, where those litte shrines feature frequently. Having enjoyed the 2008 Japanese public television drama Atsuhime (described a few posts down), I moved on to Musashi last week, expecting the same gorgeous, decorous inaction. I couldn't have been more surprised...or thrilled. Musashi takes place in a man's world, where the way of the sword is exalted and all other considerations are deemed secondary, if not worthless. Musashi, the story of Japan's legendary fighter, began as a nearly 1000-page novel written by Eiji Yoshikawa in 1935, and has gone on to sell 120 million copies and inspire 36 films. Watching the 50-hour televised version (2003) is like enjoying the novel as it had been conceived, in serial format. I knew I wasn't in the Shogun's Ooku (women's quarters) any more when the story opened with the aftermath of the Battle of Sekigahara (1600), and the young soldiers Musashi and his friend Matahachi struggled their way out of heaps of dead bodies steaming in the cold dawn. The action follows the novel with faithful attention, all the performances by the numerous cast are flawless, and the gritty realism, especially coming after Atsuhime's courtly decorum, is often startling. The lead is played by a rivetingly charismatic young Kabuki performer, and the rest of the cast make up a Who's Who of Japan's acting talent. So far I'm at Episode 28 and have witnessed every kind of desperate peril and deadly combat, along with tender devotion, offhand lust, remorseless hatred, gnawing inner anguish and hilarious broad humor, all amid striking scenery, engagingly ramshackle towns, and those exquisite interiors, rustic, regal, or religious, that Japan is famed for. The plot teems with ronin, thieves, magicians, brigands, ninja, madmen, warrior monks and nobles. The women range from demure maidens to brazen harlots, vengeful hags to dauntless warrior-lasses. The swordplay's constant, vicious, and uncannily graceful. But I'm enjoying Musashi most because the underlying theme is love, the kind that makes great sacrifices without regard to self, denying one's own happiness for a greater good. Miyamoto Musashi only gradually becomes a hero, owing his transcendence to the wise and gentle people he meets in his wanderings, who teach him that without beauty, life is meaningless, and that the creation of beauty is man's best employment; that the way of the sword is an empty, futile path. The final showdown looms, but I'm taking the story slowly, savoring a world that seems alien to the point of fantasy to my Western eyes, and yet so fundamentally, placelessly, timelessly human. How I wish I could read the novel in the original! Ah well, perhaps next life. The portal to all of Musashi's online episodes is here. I love costume. Not mere clothes, especially not the current mode best described as Goodwill Meets Frederick’s, but beautiful dress-up garments. The other night I watched Alfred Hitchcock's To Catch A Thief, and the gold lamé gown worn by Grace Kelly at the climactic ball, baring superb shoulders and trailing acres of glittering panniered skirts, had me palpitating far more than did the film’s famed rooftop chase. 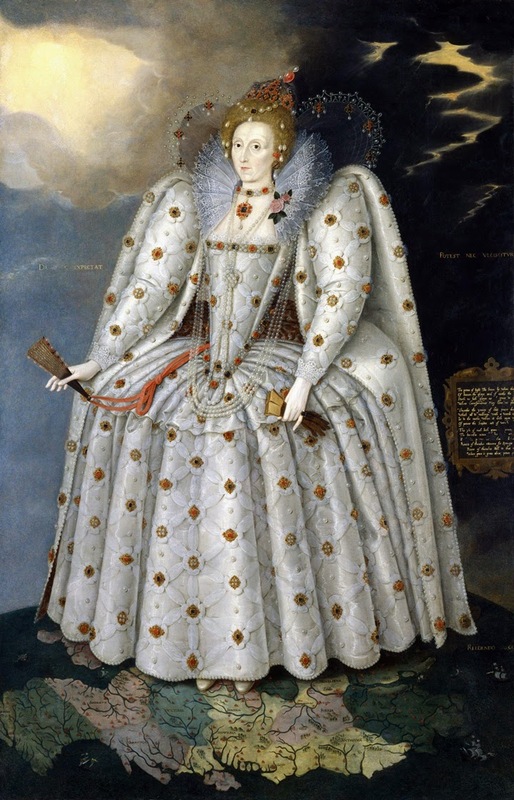 The 1570s were the heyday of the bumroll, a stuffed fabric ring worn under skirts to give the illusion of wider hips, and hence a smaller waist. I’d never really gotten up close and personal with a bumroll until 2002, when I attended WorldCon in San Jose. Among the con’s plethora of parties was a crush given in honor of Terry Pratchett by the Costumer’s Guild. (I call it a crush rather than a bash, because in consideration of Mr. Pratchett’s following among very young persons, there was no alcohol present save for the whacking big snifter of brandy that the guest of honor, dapper in a crimson velvet Edwardian smoking jacket, held in one hand as he greeted his guests.) The Guild’s membership was, as I recall, entirely female, and I inadvertently stepped on many a brocaded train as I mingled, sipped the innocent punch, admired the Discworld chess set that was to be auctioned off, and asked the costumed ladies about their garments, which were beautifully made and often exquisitely whimsical. The gown I recall most was an Elizabethan farthingale that combined two contrasting aloha-shirt fabrics, red and blue, worn with a choker necklace composed of a row of tiny plastic palm trees sewn onto a velvet band, jutting out fronds first. The young woman wearing this piquant confection was silvery blonde, slim, lovely and charming, and it was she who enlightened me as to why her skirts belled out with such angular symmetry, inspiring the title of these reflections.